Hello Friends, things are a little on the crazy and stressful side as I am working hard to push a few quilts out the door! So, please forgive me if I am scarce. Nonetheless, I am happy to share with you my first free pattern of the year, View on Lexington. View on Lexington is designed using a newly released Benartex fabric line, Gramercy. There are some very beautiful, but different looking florals in this line. Click here to view the fabric range in its entirety. Click here to download the free pattern instructions. Curious mind wants to know what you think of the Gramercy floral fabrics. Thanks for stopping by. Please know that I appreciate your friendships as always! Hugs to you all. This entry was posted in Quilt Pattern, Quilting, Quilts: Pieced and tagged Benartex Gramercy Fabric Collection, Free Quilt Pattern, Wendy Sheppard Designs. Bookmark the permalink. My favorite, florals…….perfect for spring. I know we are just less than a month into winter. Oh well…………. 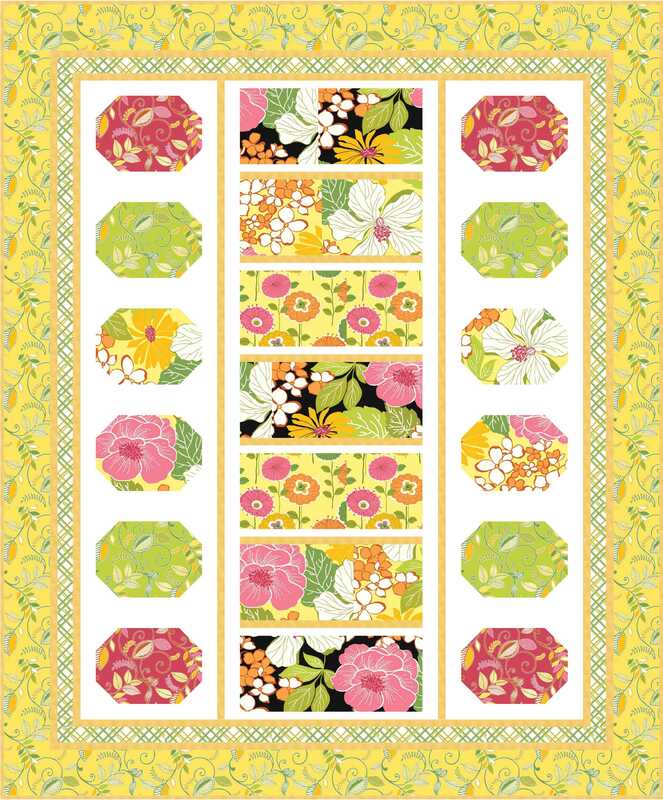 I am not usually a lover of big prints as not sure how to use them to the best advantage but now changed my mind, these especially the florals are lovely along with the quilt design you have shared with us today. What a happy quilt! Love the yellow. LOVE these fabrics, and your pattern shows them off beautifully! I tied to download the pattern, and page 2 (two) seems to be missing………………………..
You might try again – when I open the link, page 2 was there…. Yellow is my favorite color…just makes me happy! My first thought when I see big florals is “I wonder what it would look like in a kaleidoscope?” I love playing with the mirror and seeing all the beautiful patterns that can come from a single large print! I love Benartex’s bold floral fabrics and your simple design really features the fabrics. I think I am finally getting use to some of the “modern” quilts and designs – this one makes me want to make the quilt. This is a cheerful quilt. Your design can apply to lots of different fabric lines and themes. Love it! did you use for the backing?